The 2040 Project: Baby it's cold outside! What to wear for cold weather exercise. Baby it's cold outside! What to wear for cold weather exercise. Brrrr. It's chilly! However, a drop in temperature need not run the 2040 posse indoors. With the appropriate clothing we can continue to run and cycle outside in Louisiana in the winter months. It's a question of garment type, fabric and number of layers. A favorite blog post on the subject is by architect / cyclist Robert Anderson. See A Practical Cyclist: Winter Cycle Clothing Guidelines. Though Anderson's post focuses on how to dress for cycling, his recommendations are easily adjusted for running. I particularly like the chart he created. No doubt his design sensibilities played a role in his creating such an easy to read and understand chart. For now, you won't catch me exercising outdoors when the temperature drop below freezing. However, for 2040 posse members undaunted by freezing temps, Anderson's chart provides his tried and true suggestions for freezing and below freezing temperatures. 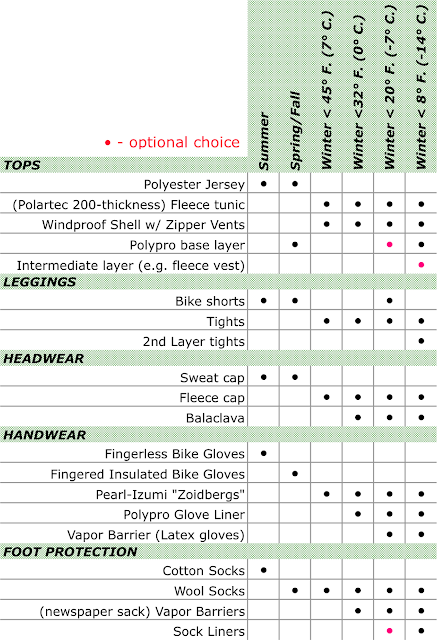 This "what to wear" chart by architect / cyclist blogger Robert Anderson continues to be my "go to" chart for figuring out how to dress for various weather conditions. One addition I make to Anderson's chart is ear warmers or a headband designed to cover my ears. When I run or cycle in temperatures below 50 degrees, the cooler air causes my ears to ache. I find that wearing ear warmers keeps my ears from aching. I'll even wear the ear warmers with a beanie under my helmet. In the past when I've worn only a beanie, it would sometime ride up over my ears during my exercise. I seem to have better luck keeping my ears covered with the warmers / headband. A headband like this keeps my ears toasty warm. In colder weather I also add lip balm and face cream to my "what to wear" list. Both lip balm and face cream a protect my lips and face from chapping or wind burn. In lieu of the fleece tunic and wind proof vest, I've been successful staying comfortable by using multiple layers. Just last week, I biked in 44 degree temperatures. For my torso I wore 3 layers: short sleeve wicking top, arm warmers, long sleeve wicking top and a zippered pullover jacket. With multiple layers, I can always peel off a layer and tie it to my waist if the temperature (or I) warm up too much. all i wear is fleece in the winter - i sleep in it too. right now i am wearing polortech? fleece hoodie (without the hood - hehe) and pants. every day. love it. and please - don't say pandering!!!!! omg!!!! i loved your comment - pandering! heheee.